Today, I was working in a computer lab at Simon Fraser University (I'm a student there!) and suddenly, I had the urge to buy a drink. For some strange reason, I ended up getting my drink in the form of green tea at Sushi UOmo, a new restaurant that opened up in North Burnaby approximately two months ago. The door was kept open when I arrived and both the waitress and the sushi chef looked welcoming. As I stepped into the restaurant, I noticed that the FIFA World Cup was being broadcast, which was just what I was looking for. The restaurant was filled with the aroma of freshly cooked Chicken Teriyaki (because someone had just ordered it), which did a good job of increasing my appetite. Upon looking at the menu, it was evident that the owner was a big fan of Sushiyama. The dishes offered as well as the prices varied very little from the menu at Sushiyama. Since I am a regular of Sushiyama, I wondered if the quality of the food at Sushi UOmo would be good enough to be a substitute for Sushiyama, which is almost always full with a line-up accumulating near the front entrance. I was too focused on watching the World Cup and was not ready to order until the waitress politely asked me for the third time if I was ready. I commend her patience. The Appetizer Sashimi contained one piece of geoduck sashimi (yes, geoduck! 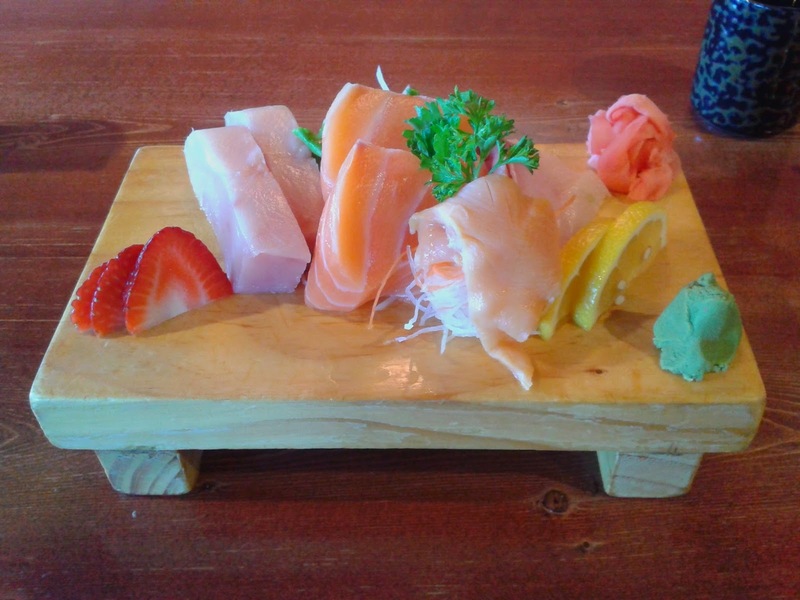 ), two pieces of hamachi, two pieces of salmon and two pieces of tuna. All of the sashimi had a taste of freshness but the thing that strikes your eye most is the size of the pieces. The salmon sashimi and the tuna sashimi were huge! If you are looking for value in sashimi, this is it! The geoduck sashimi had the chewy quality of geoduck and was slightly slightly sweet and slimy. The hamachi sashimi was quite smooth, but had a little too much of a fishy taste. The salmon was served at just the right temperature, but was weak in flavour and on the tough side. The tuna was softer and a little cooler than the salmon. I found the tuna a bit too salty. This is a torched roll containing prawn tempura, chopped scallop, mayonnaise, masago, lettuce, fish stick, avocado, cheese, cucumber and spicy sauce. The list of ingredients was so long that I didn't even bother looking through it before ordering this roll ... it was advertised on a sign outside the restaurant, so it must be good, right? Well, indeed it was. There was a lemony tinge to this roll and the two savoury prawns inside worked well with the light coating of cheese. However, the cheese was not completely melted so you could see that it was shredded cheese. This roll is similar to a Las Vegas roll. 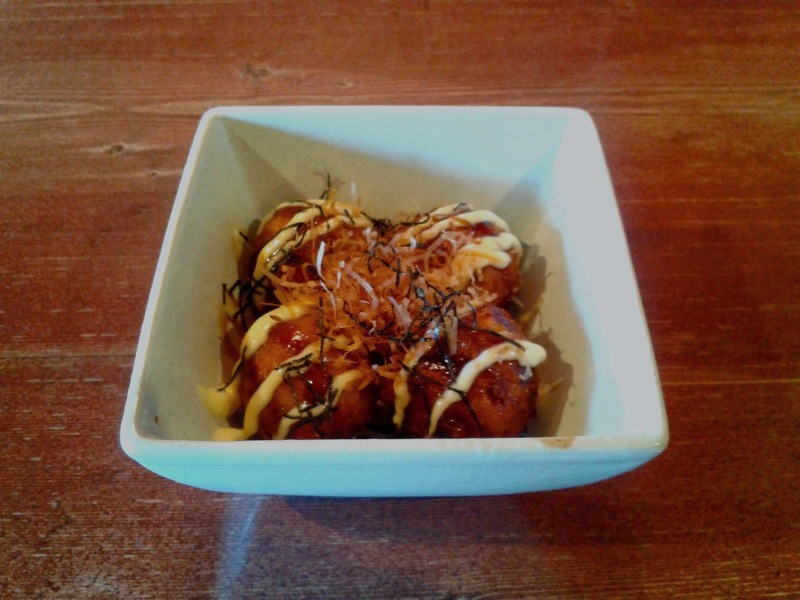 The Takoyaki came with 4 pieces of rather large octopus balls (pun not intended). There was a good balance of Okonomi sauce and mayonnaise and the Takoyaki was decorated with thin pieces of seaweed and bonito flakes. The slightly crispy exterior was successful and the Takoyaki looked promising. However, once I bit into it, something seemed a little off. The octopus was thicker and stiffer than the octopus in your average takoyaki - the texture and taste reminded me of when my mom buys dried octopus from a Chinese herbal store and then boils it in soup. There were a few minor mishaps in the food quality here and there, but overall, my meal was pretty good. Freshness was present in every dish, and I would save quite a bit if all of my sushi adventures took place at Sushi UOmo. All things considered, I was quite surprised to see that this restaurant was more empty than full. Perhaps its better days are still yet to come? Thank you for reading my blog and for your support!